Condo, 3 Bedrooms + Convertible bed(s), 3 Baths, Community Pool + FREE BIKES!! 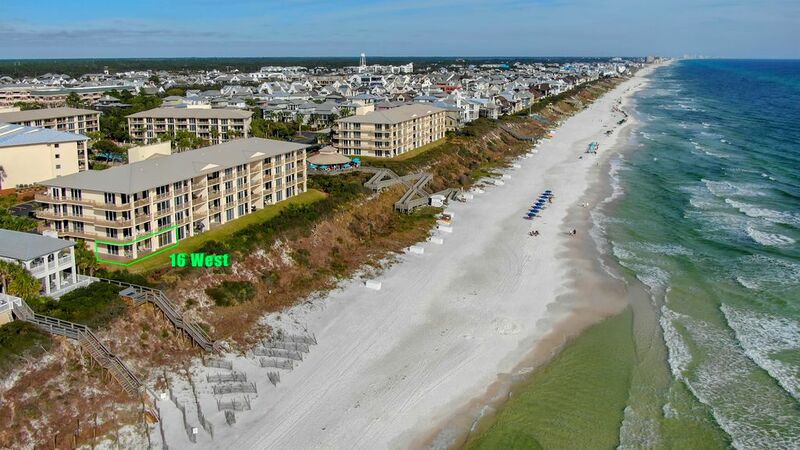 A Beautiful 1850 sq ft. 3BR/3Bath Gulf Front Condo at High Pointe Beach Resort in Seacrest Beach (next to Rosemary Beach)...with amazing views of the Emerald Green Waters of the Gulf and the Sugar White Sand! Come enjoy stunning sunsets and tranquil ocean sounds from a deluxe condo, 'Seadawg'. It sits on one of the highest points on the Florida Panhandle! Seadawg is a 3 bedroom, 3 bath corner ground unit. The serene master bedroom has a king bed with it's own private master bathroom suite. Newly updated granite countertops with double vanities and glass shower. Also there is a large garden tub is perfect for those relaxing nights. One of the guest room has a queen bed with it's own private bathroom suite. New granite counter tops with double vanities and a shower/tub combo along with a large closet. Second quest room has twin beds and is bright and spacious. It has an attached bathroom with shower/tub combo and single vanity with new granite countertops. The bath is also accessible from the hall. The large fully equipped kitchen has new granite counters tops and backsplash. It opens up to the dining and living room which gives it a spacious feel. Lots of counter space as well as a bar that allows more room and seating in the kitchen. Off the kitchen is the dining room with seating for 6 along with 3 bar stools. The dining room opens up to the breathtaking views of the Gulf. The access to the patio is off the dinning room. Stay with us and you will see why the High Pointe Beach Resort staff calls ours the 'best unit at High Pointe Beach Resort.' The developer built this condo for himself with many extras such WIFI, wet bar with ice maker, limestone tile, plantation shutters and an excellent entertainment system with DVD, CD and speakers throughout. Kids and adults will love the easy beach access, convenient beach services, restaurant on site, grilling areas, tennis court, playground and shuffle boards, along with a 6,500 sq. ft pool with waterfalls and a hot tub surrounding the lush landscaping! Crabby Steve's gulf front bar and grill is right on the property and is the only true gulf front dining experience on all of 30A. Fabulous dinner specials and always a fun place to unwind. Located next to Rosemary Beach, and minutes from Seaside, this really is a deluxe unit in the perfect vacation spot. 5) During summer 2018, Gulf Views may be temporarily partially obstructed due to environmental permit delays. In my opinion, the beaches of South Walton County are the prettiest in the country and High Pointe Resort is the best location, situated between Rosemary Beach and Alys Beach, and is fantastic for kids and adults.